Because wireless networking speeds are usually lame when compared with wired networking speeds, we often celebrate and focus primarily on speed enhancements when new Wi-Fi products and standards hit the market. 802.11g is 5x faster than 802.11b. The 802.11n spec offers more than 10x the data rate of 802.11a/g. But, if we’re too narrow, we miss a number of other important features that come with hardware upgrades. 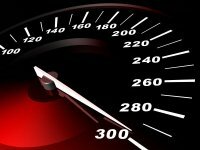 Vendors and industry leaders often focus on speed gains in marketing and industry articles, citing potential throughput or capacity as the primary criterion by which to justify (or downplay the need for) an equipment upgrade. So we end up asking questions like this: “Do three spatial streams (450 Mbps) provide enough added capacity over two spatial streams (300 Mbps) to justify a refresh?” That question is OK, and in some situations, may be quite relevant if you’re really utilizing the full capacity of a two stream link (very very few are doing so). However, speed is such a small piece of the “should we upgrade?” question. If you were shopping for a new car for your family, you would laugh yourself silly if the salesman continued to sell you only on top speed. Of course, even if we want a faster car, there are practical restrictions that prevent us from utilizing the car’s top speed. For example, basic driver safety and speed limits (i.e. WAN bottlenecks, rate limits, slow client feature integration, backward compatibility with legacy devices, etc.) keep us at modest speeds. Newer cars provide other improvements, and are usually more efficient with lower emissions, more reliable, more comfortable, and have better safety features while including other new convenience technologies that get us excited. Yesterday’s premium features are tomorrow’s standard fare; it’s the same in auto, networking, and wireless. Further, most 802.11n WLANs today are under-utilized, so speed is not what you're missing. Features that enable bursts of high-speed traffic, like load balancing, band steering, and airtime control, are also important. Businesses want smarter WLANs that solve business problems; they want capabilities like application awareness and control, reliable mobility, spectrum analysis, mobile device provisioning, simplified deployment and network management, and system reliability with redundancy and seamless failover. Any wireless product has a limited shelf life, and for chipset manufacturers, software development for new features and fixes for old features eventually stops on existing products. The focus is shifted to next generation products because there are new capabilities; why fix something old if you can sell something new instead. :) For example, look at Atheros’ last generation of 3x3:2 chips, which had spectrum analysis support, but it wasn’t very good, and it wasn’t getting any better because they stopped development on that chip even though there was a large installed base. With hardware, one key feature enhancement with new products is better spectrum analysis support. Previous generations of Wi-Fi chips didn’t have the logic to analyze the RF spectrum, but newer chips have sophisticated spectrum-aware logic. To get this intelligence, you need to make hardware changes. Granted, some earlier chips could do limited spectrum analysis, but next generation chips are immeasurably better. And as electronics improve, wireless devices get better processors, allowing more sophisticated features like integrated spectrum analysis with auto classification of interference sources. As the WLAN market becomes more competitive and continues to grow, infrastructure vendors are seeing the benefits of custom radio hardware that enhances the AP’s RF performance. For example, more vendors are utilizing discrete radio components like power amplifiers and low noise amplifiers, which improve communication reliability. Improving RF performance is particularly important with the surge in less capable clients in the mobile revolution. Chipset manufacturers are also including support for new parts of the 802.11 protocols that have not been implemented in previous products, such as transmit beamforming (TxBF), LDPC coding, STBC, and others. Again, these features don’t always motivate customers to sign on the dotted line, but the cumulative gains of these sidebar changes can add up to a noteworthy performance boost, which may make the difference between acceptable performance and unacceptable performance for some applications or devices. WLANs are simply becoming more capable, and when business applications are on the line, speed is not the only enhancement to care about. Interestingly, though most APs are becoming more powerful and more capable; better electronics (processors, memory, radios, etc.) are also making them more efficient, requiring less power to operate. So, when yesterday’s 802.11n 2x3:2 AP required high-power 802.3at, today’s premium 802.11n 3x3:3 AP only requires 802.3af. More features, more processing, more memory, less operational power. This is especially important if power sourcing infrastructure (Ethernet switches or midspan injectors) has been a point of hesitation for an upgrade. Should you upgrade to today’s premium APs? With any technology question, the answer is “it depends.” It depends on many factors beyond speed. We focus on speed and throughput because it’s easy. It’s easy to quantify incremental changes within the technology, and it’s easy to compare with other access technologies like Ethernet. But, when wireless has many other important features and performance metrics, focusing only on speed is myopic. One blogger, who happens to be a good friend, raises other points that further question our focus on speed. In light of that, let’s continue to celebrate added capacity with speed gains, but let’s not neglect the many other enhancements that improve how we use the WLAN to run our businesses.